The France-Macau Business Association (FMBA) held its seventh annual gala dinner on Friday, with the theme, “Shanghai: Le Paris de L’Orient.” The aesthetic of the event replicated the glamour of Shanghai in the 1920s and 30s when the city was considered the cultural capital of Asia. 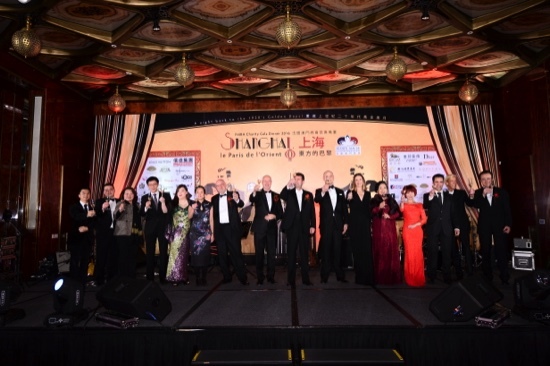 The gala dinner was attended by over 320 guests in the Grand Ballroom of MGM Macau. They were treated to an evening of music and dance performances tailored specifically for the event. Among those performing was violinist John Ma from Collegium MCMC, who presented a rendition of “Soirée Musicale,” and choreographer Lisa Souissa of Absolute Entertainment Macao, which is known for its showgirls and cabaret-style performances. Event organizers said that the gala dinner raised a total of MOP68,300, which will be used to support the work of two charities, Architecture Sans Frontiers – Macau (ASF Macau) and Cradle of Hope. ASF Macau operates at a local and regional level to promote a sustainable and socially responsible environment for disadvantaged people and communities by improving access to shelter, basic sanitation, health and education. Cradle of Hope is a non-­profit charity organization based in Macau that has helped abandoned babies and at-risk children since its establishment in 2000. “As Macau continues to transform into a world center for tourism and leisure, we hope to support our members to leverage on arising opportunities, and help foster trade and cultural partnerships and friendships for a healthy future together,” Verschuren added. “We even have an Eiffel Tower under construction here!” he exclaimed.